Shannon O'Dell's "Transforming Church in Rural America" is an interesting and awakening read about a rural church in a town in Arkansas. The author, who is also the pastor of what used to be called South Side Baptist Church, shares how God has called him from working as a church staff at a very large church to leading a church whose attendance, offerings and vision is limited. He shares how, in a six-year period, God has blessed the ministry that was entrusted to him, now known as Brand New Church, to reaching through multiple campuses week after week to thousands of people. Being a pastor myself, "Transforming Church in Rural America" by Pastor Shannon O'Dell has challenged and inspired me to continue ministry with a bigger vision. I particularly like how the author capsulized the way anyone can fulfill the vision that God has given - CHANGE, CONFLICT, GROWTH - the process through which everyone should go through with a focus on vision, attitude, leadership, and innovation and of course the right heart and security in Christ which surpasses other physical and material concerns - even with ESET Endpoint Security account or millions in the bank, nothing surpasses dependence on God. 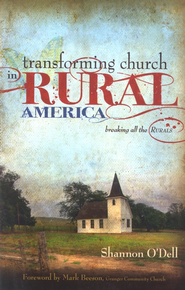 In this book review, I highly recommend "Transforming Church in Rural America" to those who are involved in ministry - pastors, of course, and faithful volunteers who can help support their pastor as they are led to a greater vision in their ministries.